Q&A has landed on the iPhone via the Ask.com app. Having dropped the search engine business model, Ask.com now does what the name suggest. It offers a hub for users to ask questions, answer questions asked and get answers via a large user community. While you may still find it easier to just “Google” your questions, Ask.com might be a good alternative for getting answers to your tougher questions requiring specific answers. If you are the giving kind, you’ll also love being helpful by sharing your specific expertise with other users by entering your own responses to questions sent your way in the Ask.com app. Each member is asked to enter their area of expertise by keywords. Posted questions are also tagged with specific keywords by the inquiring party. These keywords are then matched by Ask.com to match inquiries with experts who can best answer them. The ability to speak your questions using the built in iPhone microphone and have the audio converted to text by the app for posting. You just say your question, and the app converts it automatically. With push notifications sent to your iPhone, you’re notified instantly when new answers come in on your iPhone. In the My Q&A tab you see a list of all your questions, whether asked, answered or picked for you to answer. Each user on Ask.com has a profile, including you. In the My Profile tab you can add additional information about yourself like your location, your hometown and a short bio information. You can pick an avatar or upload a picture from your iPhone. Your profile shows how many questions you’ve asked, and how many you have answered thus far. When you get an answer from someone, you’ll get an email and a push notification on your iPhone. You can then view the answer and check out the respondent’s profile. You can rate each answer by choosing thumbs up or down, reply to it with your own comments or even flag it as inappropriate. You can view recent questions as they come in or browse by category in the Ask tab. Unfortunately, there is no way to search for questions or answers by keyword in the Ask.com app. 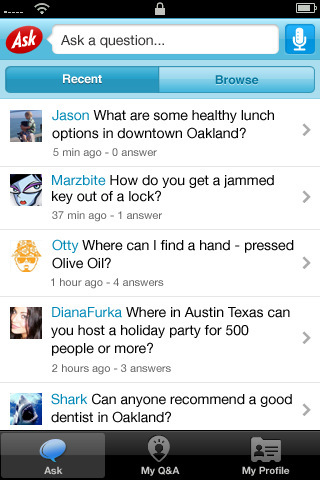 Overall Ask.com is a perfect companion app for your iPod touch or iPhone that lets you post new questions and get answers from the Ask.com community of users. Once you’ve downloaded the free app, you can log in or sign up for a new Ask account, or if you’re just curious you can can skip the authentication and just browse questions and answers. 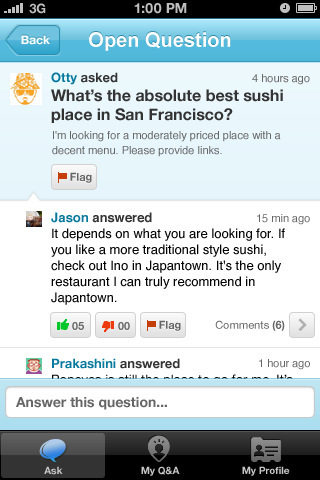 AppSafari review of Ask.com was written by Joe Seifi on May 4th, 2010 and categorized under App Store, Portals, Reference, Search. Page viewed 4675 times, 1 so far today. Need help on using these apps? Please read the Help Page.